The best thin latex pillows are usually designed to meet the needs of people who prefer sleeping on their backs or stomachs. The low height helps prevent the pillow from forcing sleepers into weird positions that could cause muscle aches and joint pain, especially in the neck, shoulder, and spine. If you've been looking for the best thin latex pillows, you may have noticed that some of them are a little more expensive than what you're used to. While they may not cost as much as top quality down pillows, they're certainly more expensive than cheap alternatives. While they may not cost as much as top quality down pillows, they're certainly more expensive than cheap alternatives. You may wonder why you should spend more money on a latex pillow. Do the advantages merit the increased cost? For many people, yes, they do. Is the same true for you? Well, that depends on what you want from your pillow. Before making a purchase, consider how much these four benefits matter to you. There's a good chance that you will agree with other people who love latex pillows. If you wake up with aches and pains, then it's probably time to explore new pillow options. Latex pillows are often perfect for people who experience neck, shoulder, and spinal pain while they sleep. Whether you toss and turn all night, or you dread getting up in the morning, a latex pillow could probably help. Latex is a fairly firm material. That helps it give you better support while you sleep. Obviously you don't want a pillow that's too firm. Not many people feel that latex pillows are overly firm. They're just right. If you find that latex pillows are too firm for you, you may want to consider a pillow with a latex core surrounded by other materials. How long can you use a pillow made of polyester or a similar, cheap material? Some experts say that you should replace those pillows every six months. That seems a little often. A review of expert opinions shows that you have a maximum of two years. After that, you will probably start to experience aches and pains. You'll twist and turn during the night. You'll go through the next day like a zombie. Latex pillows are much more durable than that. How much longer? That depends on how you take care of them. With proper care, you can easily use some latex pillows for five years or more. Even with the higher upfront cost, you'll save money and time in the long run. There are some people who are allergic to latex. Obviously those people should not use latex pillows unless they are wrapped in a thick material that protects them. With that said, a latex pillow is one of the best options for people who suffer from common allergies. If you're allergic to dust and dust mites, a latex pillow could significantly lower your reactions during the night. That usually means you get more, better sleep. Latex also has antifungal and antimicrobial properties that make them healthy to use. Even you're not allergic, you don't want to rub your face in dust mites and microbes all night. It's difficult to clean some pillows at home. It's tough, for instance, to get good results washing a down pillow. The washing machine tends to make the features clump and a soak in the tub tends to make them waterlogged. Thin latex pillows are much easier to clean at home. Most of them come with cotton covers that you can just throw in the washing machines with your other bedding. The latex pillow itself shouldn't go in the wash, but it only takes a few minutes at the kitchen sink to get it clean. Start by filling up the sink with lukewarm water. Add some detergent and mix it around. Use the water to dampen a rag and gently blot the dirt and stains away. That's all it takes. When you need to dry the pillow, place it between two dry towels and press down on the top one. This will get most of the moisture out. You can then let it air dry. It usually only takes a couple hours to dry. Of course, that depends on how much water you use. 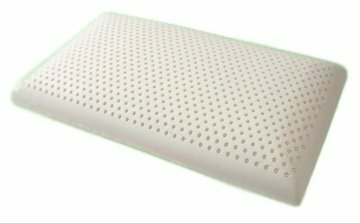 The Slim Sleeper Natural Latex Foam Pillow from DC Lab has several features that make it one of the best thin latex pillows on the market. The latex is completely natural, so it resists common problems like dust mites, mildew, and fungus. If you have allergies, this is a good option. That assume, of course, that you are not allergic to latex. DC Labs designed this pillow with comfort in mind. It has a pinhole design that encourages air circulation. This will help you stay cool while you sleep. If you feel like you get too hot to sleep during the nights, this is a good alternative to pillows made from materials like down and Memory Foam. The Slim Sleeper comes with a cotton outer cover that helps it stay in top condition even after several years of use. Click here to read more about the Slim Sleeper. Unlike many latex pillows, this design from Natura is made from a mixture of latex, organic wool, and organic cotton. It has a solid latex core that helps the pillow retain its shape so that it continues to offer excellent support for years or even decades. The extra materials, however, make the pillow a little more pliable than most latex pillows. It sinks under the weight of your head, which makes it a comfortable option for people who prefer low profile pillows. The top layer of this pillow is made from pina cotton, one of the softest types of cotton available. Directly under this is a layer of wool that improves comfort and whisks away moisture. That's definitely a good feature for people who get hot while sleeping. The wool lining also helps reduce your exposure to any off-gassing that might occur. 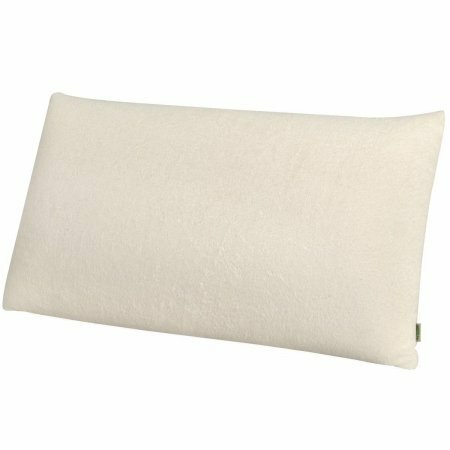 The All Natural Latex Low Profile Pillow from OrganicTextiles has a height of four inches. Considering how little latex sinks when you put your head on it, you can expect it to stay somewhere between three and four inches during the night. This low profile makes it a good option for people who like to sleep on their stomachs or those who simply like to lie flat on their backs. This OrganixTexctiles pillow is not recommended for side sleepers. Realistically, your head would probably sink pretty far, which could cause neck or shoulder pain that would disrupt sleep. At the very least, using this pillow to sleep on your side could lead to some early morning aches. The latex pillow comes with an organic cotton cover with a zipper. It also has an inner cover made from organic cotton. These features, combined with latex's natural, hypoallergenic properties, should help allergy suffers get uninterrupted sleep. This is a unique item that's designed for a wide range of uses, including travel and home use. If you spend a lot of time on planes or airplanes, this pillow will help you stay comfortable during your travels. It's design also makes it a great option for people who experience hip, knee, and spinal pain. Putting the pillow between your knees at night can help relieve pressure that contributes to pain. The materials used to make this pillow also stand out as somewhat unusual. Yes, the pillow is made of natural latex, but it also has an inner cloth casing that adds comfort and makes it easier to clean. Also, the pillow has a genuine leather outer cover that has been described as ultra-soft. Like most latex pillows, this design is hypoallergenic and resistant to some of the most common causes of allergies, including mites, mildew, and mold. 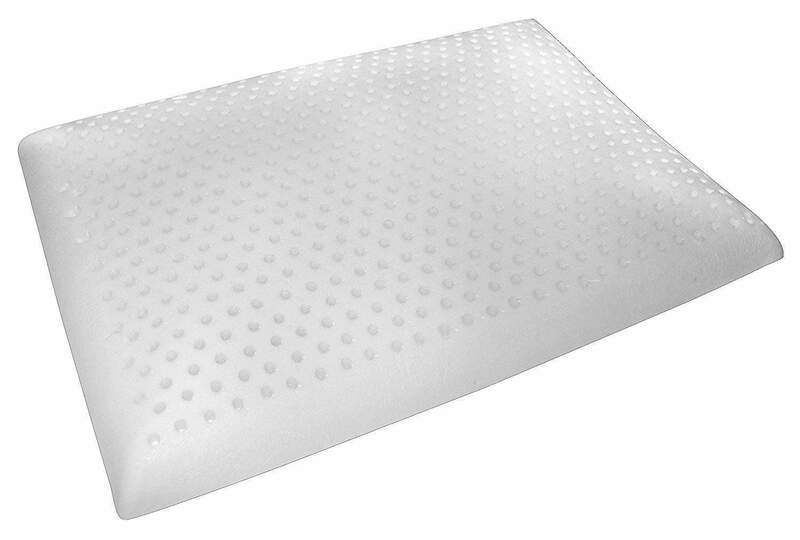 The Ultimate Natural Latex Pillow from Natura has a height of six inches. That may sound a little tall for a low profile pillow, but it has other features that make it a good choose for people who prefer less elevation from their pillows. It's important to recognize that this pillow has a latex core. It isn't entirely made of latex. It also has a NaturaWool lining and terrycloth cover. These layers cause the pillow to sink a little more than most latex pillows. Still, the core remains firm to give you a good night's rest. Still, if you want a pillow with a profile lower than four or five inches, this isn't the right option for you. The wool and terrycloth materials also offer other advantages. The wool lining helps regulate the temperature to keep you cool at night. And the terrycloth just feels soft and wonderful.